So pretty! I love your card design! Love your card! I've always loved the pink and chocolate color combination. Thanks for sharing! Such a pretty card! Love the color combo and that cake is awesome! Love the details/layers this die allows you to create with! Great design. Love the pink and chocolate combination, and the Confetti stencil background is so fun! This is so pretty (and now I'm kinda hungry). Love that cake die! What a pretty design! Love the Color combo and this yummy cake! The birthday cake die-namic is very original. Beautiful color combination. Pretty cake and background. Love he colors and design. Love your cake colors and background. so pretty. What a fun idea!! Absolutely beautiful! Beautiful birthday card design, thanks for the inspiration! This is such a fun card! I rarely go for pink and brown, but every time I see it, I think "That is so pretty!" so maybe I need to try it. Thanks for sharing with us. It is a fantastic release, isn't it? Wish my paper-crafting budget was much bigger this month. Love the cotton candy and hot fudge Birthday Cake! Beautiful card! Love the color combination and design! Lovely card!! Yummy birthday cake! Great card Julia. I love how you layered the cake onto the pink circle. Great colors!! Love the use of the pink, brown and white card stock. It goes together so well. Another amazing card! I love the hot pink & brown combo you chose and the cake is sooo fun! Love the pink and brown together! LOVE this cake! Very fun card! Yummy card! Who can resist a chocolate cake? I bought the birthday cake die set, thanks for the inspiration! I love your bright, festive card. Your recipient will love it! Love your card! The Birthday Cake die is so much fun and so is the confetti stencil. The pink and brown combination is really pretty! Thanks for the inspiration Julie! your card is lovely, this color combo is one of my all time faves! Love this new cake die! Such a beautiful cake in pink with a terrific design! Pink & brown... so chic for this cool cake!! I love this card and the colors you used! beautiful work - love all the pinky-ness!!! I love the colour scheme, feminine but not too much! Love the colors you used and the layout of the card. This cake die is awesome! You card looks so yummy. Great Job! Such a beautiful card - fabulous design! Love the confetti background! So cute! I love that cake die! What a fun card! I love the design and colors! 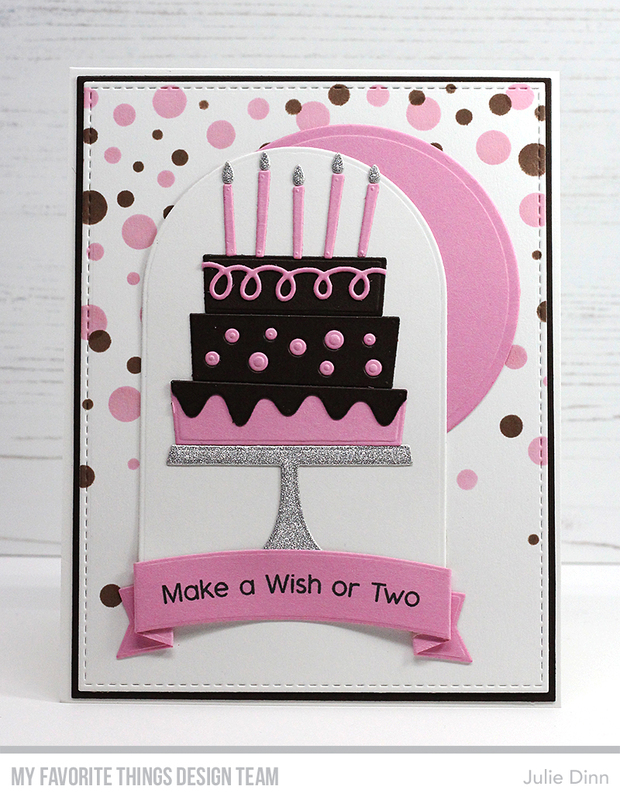 Love the pink & chocolate combo & the Birthday cake die has been added to my wish list! Awesome card!! Nice color combination. Like the confetti stencil. Love this color combo--it is one of my favorites. Super sweet and wonderfully festive card! I love pink and brown together. I want this set!!! The cake looks good enough to eat. Thank you for sharing this card. I love your card! That color combo is one of my favs. Very adorable!